Encik Johan bin Hamidon was appointed to the Board on 28 August 2012. He obtained his Bachelor of Arts Degree from Murdoch University, Perth Australia in 2002. 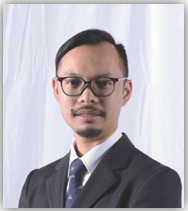 Encik Johan has extensive experience in automotive business functions in business development, manufacturing operations and supply distribution. In his incumbencies he has reengineered business operations, improved logistical supply practices, improved manufacturing efficiencies and laid down foundations for operational growth. His parents, Hamidon bin Abdullah and Dr Linden Hamidon and brother, Aidan Hamidon are also Directors and major shareholder of the Company. He attended four Board Meeting of the Company held during the financial year ended 31 December 2017.